It is said that the first recorded car accident to take place in the United States was between a car and a bicycle back in 1896; back then there were a lot fewer cars and bikes on the road. Today an average of 700 bicyclists are killed in cycling accidents a year and another 45,000 are injured. Even with those statistics cyclists are on the rise, especially in large cities like Chicago as many commuters are switching to bikes for their daily commutes. In response to this Share the Road campaigns are popping up and many cities creating lanes just for cyclists. The city of Chicago is in the process of creating a 645-mile network for cyclists and their Divy bike share program reached one year old over the summer. Cyclists are here to stay and have just as much right to be on the road as drivers, so it is important to be aware of bikes on the road. • For all intents and purposes bicycles are vehicles, but that doesn’t mean they will follow traffic laws as mindfully as you and many times cyclists will blow through a red light or stop sign even when there is traffic. Be mindful of this and don’t assume every bike will stop or even slow down at intersections. • Bike only lanes are becoming more and more common and it can be very tempting to drive down an empty bike lane to avoid congestion or to park your car in one, don’t an unexpected car in the bike lane means bikes are forced into the portion of the road with cars and that increases the chance of accidents. • Don’t expect a cyclist to hear you when you drive up from behind so make sure to give them as much room as possible when you pass by. One of the more common bicycle accidents involve a car hitting a bike from behind while passing. To avoid this from happening slow down and only pass a bike when it is safe to do so. Also, honking at a bike you are coming up on is not a good way of letting them know you are there; if you’re honk startles them enough they may swerve unexpectedly. • Be mindful of opening vehicle doors when parked on the street. 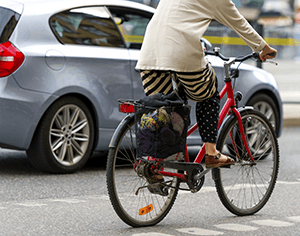 Another common bike accident occurs when either the driver or a passenger in a car opens the door without checking for bicyclists and the bike collides with the open car door. Top Driver’s Driver Education courses go over the importance of sharing the road and teach each new driver their responsibilities when it comes to sharing the road. Our highly trained driver’s education instructions will ensure your teen knows how to drive defensively and pay attention for cyclists. Sign up for one of our courses today. This entry was posted in Top Driver Blog and tagged Car Safety, Cars, Dangers in Passing, Driver Education, Driver School, Driving Classes, Driving Practice, Passing, Road Safety, Safety Tips, share the road.